Over the past few months I have been updating some writing on mobile and flexible architecture that I first prepared nearly twenty years ago, and as you might expect, much has changed in the intervening period. One of the things that stood out was that the evidence base for how we need to change human activity on our planet to make it more sustainable is now much clearer. Twenty years ago I was able to draw attention to the potential of mobile and adaptable architecture to ‘touch the earth lightly’ (an Australian Aboriginal proverb Glenn Murcutt asserts) but today I can in a few moments find clear scientific reasoning for doing this, although it is based on very complex calculations. My current favourites are the proofs produced by Global Footprint Network (http://www.footprintnetwork.org), a not-for-profit organisation that aims to evaluate and communicate human impact on the Earth. This organisation sets out a form of ecological accounting enabling measurement of human activity resource use in relation to natural resource availability. The aim is to encourage worldwide responsible use of resources in which the implications of our actions are accounted for and balanced. The data they provide is not a surprise, but its graphic representation is a shock. Developed, wealthy countries are mostly ‘spending’ the Earth’s resources at the expense of the poorer undeveloped countries, a fact Global Footprint Network communicates by its Number of Planets Needed chart depicting the number of earths required if every person on the planet spent resources in the same way as those in the countries of our richest nations. Countries with large landmasses relative to their population such as Gabon in Africa or Bolivia in Latin America have a vastly more positive ecological footprint effectively paying off the decifit that wealthy resource spendthrifts squander. 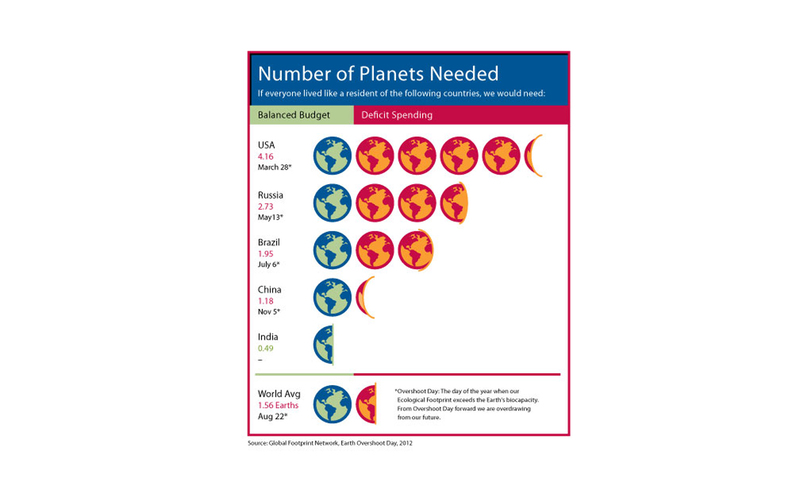 Based on the most recent full data (2008) the number of planets needed to avoid overshooting resource expenditure if everyone lived like residents of the USA would be 4.05, and if everyone lived like residents of the UK it would be 2.65. Based on UN published scientific studies Global Footprint Network’s calculations show that the entire planet has been in overshoot since the 1970s and currently expends resources each year that would take one and half years to regenerate. The bottom line is if we continue to use resources in this way forests will diminish, fisheries collapse, fresh water will become scarce, and carbon dioxide will build up further in the atmosphere. Resource scarcity leads to conflict, famine, and disease, disproportionally affecting the poor of the world the most. Changing the sort of buildings we design and how we use them significantly improves our ecological footprint no matter where they are built but the detailed decisions about how we might best do this are complex. The overwhelming proportion of buildings are static, and form the backdrop against which mobile and flexible things (furniture, equipment, people) circulate. As Bill Mitchell once said: ‘…cities consist of fixed infrastructure combined with moving parts. The moving parts provide responsiveness, flexibility, and adaptability, but they also consume more energy than the stuff that just sits there’ (http://web.mit.edu/newsoffice/2010/obit-mitchell). Active architecture that is flexible and mobile does consume more energy compared to static non-responsive construction, but it is the ‘active’ nature of the building that may also provide the resource saving. Automatic environmental control systems operate with efficiency as their prime objective, for example regulating thermal and lighting conditions in order to save energy. And mobile buildings can be made close to materials and labour resources in controlled factory conditions improving construction efficiency and reducing resource transportation costs. They can also be designed to accommodate continuous, responsive use over time, perhaps in multiple locations, reducing redundancy and waste. Designing in flexibility does have an on-cost in resources, but it is also not unrealistic to speculate that a changing, newly mobilised social and commercial environment will require buildings that are as flexible and adaptable as the morphing situation. In the recent past the typical response to the need for a transient function would be to build a temporary structure, which would be demolished after its period of use was over, with all the attendant waste of energy and materials. Mobility and flexibility affords the potential for more efficient use of the building during day-to-day operation and further useful life after the initial function is complete – surely these benefits reduce the lifetime ecological footprint of the building? However, scientifically proving the actual benefit accrued, and communicating it, is a crucial task that architects and engineers must continue to develop if they are to ensure the best flexible building strategies are adopted for the future of our planet. Those were indeed interesting facts. But could you tell me if flexible design is sustainable only in view of resource depletion? I am currently doing a project on how sustainable is flexibility in new buildings. And I would appreciate receiving your valuable comments on the topic. Well, there are others with far greater expertise than me in the area of sustainability. However, if flexibility in design enables us to get closer to finding the most appropriate solution, and one that can be adapted as conditions change into the future, I would suggest that it is making better use of available resources both at the point of initial construction and in reducing the need for future further building associated with the same project.